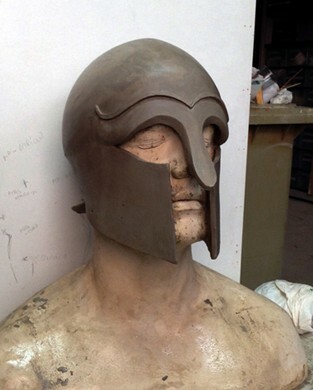 Here I post some pictures of the process of casting a greek helmet. A type of helmet from around the VI-V b.c. The job was done by Master Daniel Vidal Medina, an FX artist. It was an inmense pleasure to see him work with such care and love for the project. I brought in the idea and the obsession with the design… he understood me and my craziness with such a perfection that I got impressed and delighted. It was all a lot of fun!. Thanks a lot to Daniel and Pedro Rodriguez for being amazing Fx professionals!.